Hm, you can try to plug the numbers in my example here. I don't get the gum effect as before or after though. So we have 0,09% card drop rate when using HE Gum + VIP, which means almost 1/1000 (i'm bad at math, help me lol)? Will this increasement be applied before gum (so we will have additional 0,06%, making it 0,15%), or just add it to 0,09%, making 0,11%? Edited by bearl, 28 July 2018 - 10:17 AM. So there is no enrich hammer this time? Guess not. We had enriched hammer so often within last 2 months though. which would result with 0.06% , an actual increase of 0.02%. Hope it affects the base drop for card, and not the final item drop roll (for cards). Must be nice to have weekends off, when people use your services everyday. We had 4k votes for the weekend and never got our exp/drops. How about extending bonus exp/drops for every day you don't put it in? Edited by ShoLin, 29 July 2018 - 08:32 AM. So those 18 ways to enter can only be done once for the entire event? Or am I missing something? I'm curious about this as well. My memory is a bit fuzzy, but I'm pretty sure it was like this at the beginning of the event last year. After a little while Astra ended up adding some more options as well as making it so some of them could be repeated daily. Those are coming soon! As mentioned in the post, we'll be adding more ways to gain entries very soon, just have to get them all set up first, then you'll be able to make daily entries by tweeting and sharing. Stay tuned for updates here! Edited by azumak1, 29 July 2018 - 12:54 PM. When we they hit the mark they are suppose to add it in, not wait for next maint. We would hardly get any of the rewards. If you have a 7 day service you should be open 7days. This -_- needs fixing, how are we suppose to hit a quota if we only get to submit 18 entries once. If we were allowed to submit even 10 points a day we could have easily hit 8000 by now. This needs fixing, how are we suppose to hit a quota if we only get to submit 18 entries once. If we were allowed to submit even 10 points a day we could have easily hit 8000 by now. Xealot and Camp are reading this. Please fix this event. Seriously? You enter the thread and there is problems and you just leave? Way to prove everyone that says this is the worse managed game in existence. We need to able to vote every day. 18x 2000 people is 36,000 at max. How the hell are we going to hit 50,000? You also need to give us our rewards on the weekend if we click over the required amount, or extend the event. Edited by ShoLin, 30 July 2018 - 08:38 AM. What's stopping people from just spamming entries with fake emails? There's no validation required and you only need access to a valid email if you care about possibly getting the Grand Prize (which, in my opinion, is not that grand to begin with). Why should we fix what they f-_-ed up? Maybe the qq. “Blablabla I’ll only do when they fix this” - basically cry untill the last minute, so they can start a new qq thread saying it was unfair. I see its fairer this way since you have 1 valid e-mail for the not-so-grand prize and even so keep on boosting the entries. Edited by Hogbae, 30 July 2018 - 09:34 AM. They should fix this -_- one way or another. Just reset it every day and don't let the subsequent entries count. It is fair, however how are we going to hit 50,000? Do you know simple math? 18*2000 = ? But if people only care about the in-game benefits--minus the 'big' prize that only 5 people will win anyhow--just blast out entries with fake emails like abc123@gmail.com. 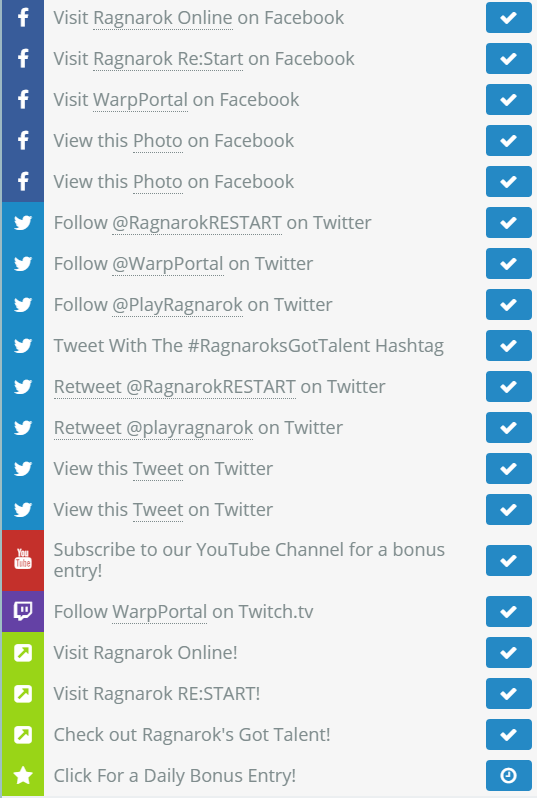 It takes 30 seconds to get 12 entries if you skip Twitch & Twitter ones and stick to the ones where you just visit a page. Doesn't even have to finish loading; click, close, claim your point. It'll get to some of the more valuable tiers pretty quickly if a bunch of people do this several times a day, for what it's worth. Would it be nice to put entries once a day per email? Yeah, but I don't think they can control how that website operates, anyway, so it's a lost cause to fight for it. Spamming fakes seems like it'd be the next best alternative. Now we only have 1. We've already implemented the EXP and Drops bonus. Loki server has to wait until maintenance for that. As for the repeatable entries, the platform we're using has changed since the last time we used it and we're still adding more ways to enter and figuring out how to gain more repeatable entries. So far, the option hasn't been as clear cut as the last time, so we're still working on it. A couple of the entries have been made repeatable, and new entries have been added as well. Check the Share Event page. Last year we added special entries worth more points only obtainable by doing certain things like attending a livestream, and we're looking into doing that once again.